American agave is common as dirt around here, Loree, but that doesn't mean I don't like it. However, I'm not sure that's what you have. The leaves look broader and flatter than what I'd expect. I find it hard to ID agaves when they're pups. Larger ones are easier because they develop distinctive growth patterns. But I know who to ask. Germi! She helped me with an agave ID recently too. 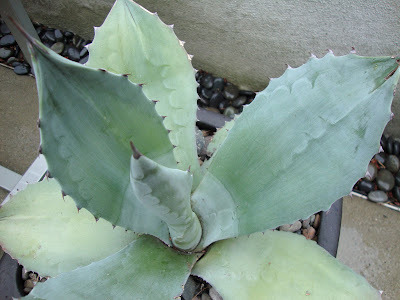 With my VAST knowledge of agaves I don't dare to hazard any guesses. 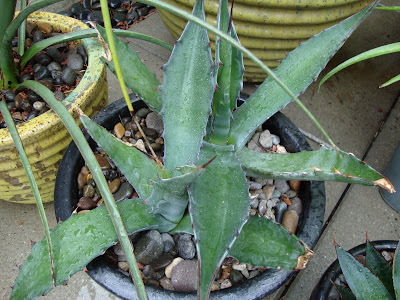 But it's interesting that the top two pictures do look kind of like my agave parryi var. truncata, only more vertical: same blue-green color and reddish thorns. 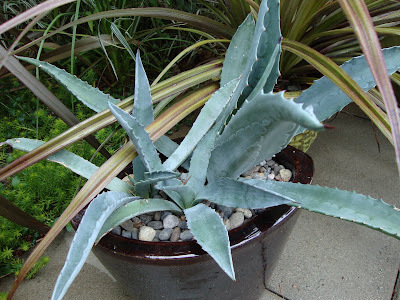 Okay, that could be a million different agaves, right!?!? 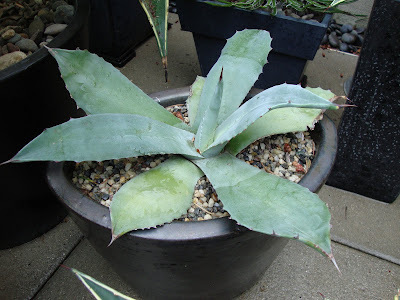 DG~~ I'm clueless about many things, Agave IDs notwithstanding. 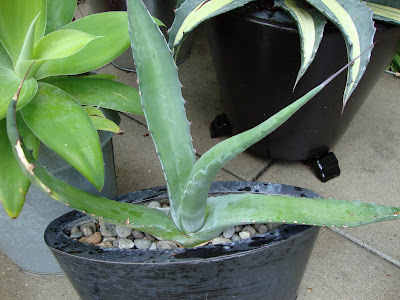 But in your last photo, on the left, the bright green plant, an Agave maybe... I love it. I am traveling back to LA tomorrow, so I have all day to plunge into my favorite topic - AGAVE RESEARCH! I will report back quickly with an answer ... the best I can muster - Pam is right, it's hard to ID agaves when they are babies, but I'll give it a good college try! I'll drop back in shortly, spiky friend! Pam, I put out an SOS to Germi...she's game to try. You make a good point about pups, I am going to try and find a picture of the in-laws yard with mature specimen's! Jane, the picture is a little deceiving I am afraid. These are bluer than green, and my Parryi is quite a bit greener than these critters. But who knows...that would be lovely since the Parryi is so darn cold tolerant. Grace, it is an A. Attenuata and you need one! No spikes, just beautiful leaves. NOT cold tolerant though. Fun to try to get the 411 on these guys, and great that your family shares the love (and the plants)! I have seen "century plant" in California but always thought it was a yucca. Is it called that because it takes forever to send up those monster bloom spikes and then the whole thing dies? I remember hearing that but it's probably wrong. Hope you get the Germi special answers! I thought you knew all the agaves! The only one I can reliably ID is A. attenuata, and Grace, you need one! They are the best! Can't wait to see what you hear back from germi.